On a recent drive, my son introduced me to the phrase which headlines this post, which reminded me that one of the great beauties of language, and a key pillar of verbal humor, is ambiguity. 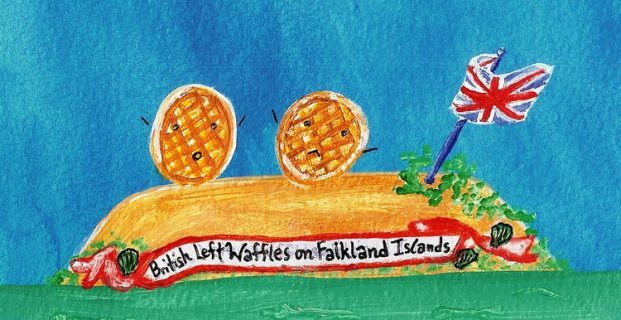 “British Left Waffles on Falklands” was an actual news headline that appeared in the UK’s Guardian newspaper during the 1982 war between Britain and Argentina over who would control the Falkland Islands. The story under that title talked about how left-wing political parties in England were pulled between patriotism on one hand and ideological distaste for both war and Conservative Prime Minister Margaret Thatcher on the other. Now that the Falkland war is history and the political leaders (both Left and Right) who argued over it retired or dead, it’s easy to read the phrase not as a description of politics surrounding an armed conflict, but rather as a far sillier aftermath involving the British leaving behind their breakfast. Ambiguity derives from the fact that many (actually most) words have more than one meaning. The most obvious example in the headline we’ve been looking at is the word “waffle” which was originally intended as a verb, but can be read as a noun in the sillier forgetting-breakfast interpretation. But on careful inspection, every word is playing a different role between the two interpretations. “British,” for example, is serving as an adjective modifying “Left” in the serious interpretation, but as a noun in the silly one. In contrast, “Left” is a noun in the serious version, but the silly version uses that same word as a verb. The phrase “Falkland Islands” serves as a noun in both versions, but in one version it refers to a set of Islands (silly), in another to the Falklands War (serious). Even humble little “on” is being used to mean “about” (serious) vs. “in a specific location” (silly). As much fun as ambiguity can be when it comes to jokes that play off mistaking one definition of a word for another, when it comes to critical thinking, such ambiguity presents serious obstacles to understanding. For instance, many examples and case studies in Critical Voter use logic to separate truth from falsehood, or at least separate strong arguments from weak ones. This is done by turning real-world human language into structured arguments which can then be analyzed for validity and soundness. Tests for validity and soundness are relatively mechanical. Premises either lead to a conclusion or they don’t (the test for validity) and premises can be tested for truth or reasonableness (the test for soundness). But the process of translating everyday human language into clear-cut statements that can serve as the basis for analysis is more of an art than a science. When performing such translation, a critical thinker’s job is to generate statements that are as unambiguous as possible, that is, statements that all reasonable people would agree mean the same thing. For example, in a premise that reads “All dogs are animals,” the word “dog” is obviously referring to a specific animal, rather than a crappy car or ugly date (both slang definitions for the word “dog”). Once you get past such simple examples, however, things become tricky – especially when the people generating the language that needs translation are trying to trick you. For example, when Hillary Clinton claimed that she had turned over documents requested of her by the FBI when she was being investigated for use of a private e-mail server; did she mean she had thoroughly complied with the FBI’s request (which would imply that the phrase “turned over documents” be translated to “turned over all requested documents”)? Or was she trying to give listeners that impression of full compliance, which turned out to not be accurate, through the deliberate use of ambiguous phrasing? We could easily come up with other examples from other politicians contemporary and historical, Left and Right using ambiguity to mislead (although Donald Trump’s highly confusing language makes it difficult to know where to start). But an unwillingness to put the work into figuring out what people are actually saying (by, for example, deliberately translating the statements of candidates we don’t like in the most ungenerous manner possible) puts us at a deficit of understanding before any rules of logic or other critical-thinking techniques can be applied.